Motorcycle seats are designed to be comfortable while you are riding them, unfortunately this also makes them attractive to kitties in search of a cozy cushion to sit on. Cat claws can cause serious damage to the material of your motorcycle's seat, so keep your prized mode of transportation away from your feline friend. If this isn't possible, place harmless training aides on and around the motorcycle, which won't hurt a cat but will discourage him from sitting on it. The best way to keep a cat off of your motorcycle seat is to keep the seat out of the reach of his little paws. Place your motorcycle in a garage that your cat and other neighborhood cats don't have access to. If this isn't possible, purchase a thick weatherproof cover or tarp for the motorcycle that you can use to protect it from a cat. Choose a motorcycle cover that has a drawstring closure to prevent a cat from getting under the cover and sitting on the seat. Kitties won't be tempted to sit on the motorcycle seat if it's covered up and inaccessible. The cover will protect the seat even if a cat tries to sit on it. Cats are finicky about the types of surfaces they will walk on or sit on. Place an upside-down plastic carpet runner over the seat of your motorcycle to discourage a cat from sitting on it, recommends the Humane Society of the United States. Our feline friends don't like the nubby surface of the plastic. You also can wrap the seat in aluminum foil, whose texture cats don't like to sit or walk on. Another option is to apply double-sided tape on the seat while you're not using it for a few days. Any cats who have been sitting on the seats will be discouraged to do so again by the sticky texture and typically won't return even after you stop applying the tape. Set up a motion-activated pet alarm next to your motorcycle, which emits an ultrasonic tone that will scare cats and other animals away from the bike without disturbing you or your neighbors. Ultrasonic tones can't be heard by humans but can be heard by many animals, including cats and dogs. You also could tape a small motion-activated cat deterrent near the seat that emits a puff of air to scare a cat away. When using these devices, cover the seat with a few towels to protect it from the potential scratches of a scared kitty jumping off. These training aides won't harm the cats sitting on your motorcycle's seat but will teach them that doing so is unpleasant. Create a cozy kitty nook for either your cat or a neighborhood cat to snuggle in that is more tempting than your motorcycle's seat. 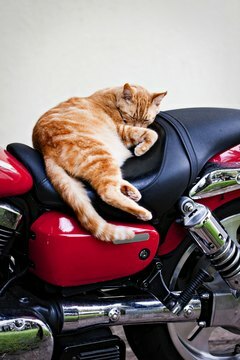 Our feline friends enjoy sitting in elevated spots, so place a cushion or cat bed on a table, shelf or cat tree, at about the same height as your motorcycle's seat, near your bike. For the best results, discourage the kitty from sitting on the bike's seat with an upside-down carpet runner and provide the cozy alternative. Pretty soon, the kitty will head straight for the cat-specific spot and ignore your bike. Country Living: How Can I Keep My Neighbor's Cat Off My Car?